There's this great radio ad for a certain beer that salutes the inventor of the taco salad. It proclaims the genius of that dish, noting that despite the meat, sour cream, cheese, and the deep fried taco shell it's served in, it's still a salad. Along with health cachet that name carries. In Southeast Asia, particularly in Thailand, salads are unapologetically hearty. Take for example, the crispy pork belly salad. In this case, pork belly isn't some second fiddle to a bed of greens - it is the bed. Bright, acidic, fragrant with lemongrass and fish sauce, this salad eats as a meal with a side of steamed sticky rice. 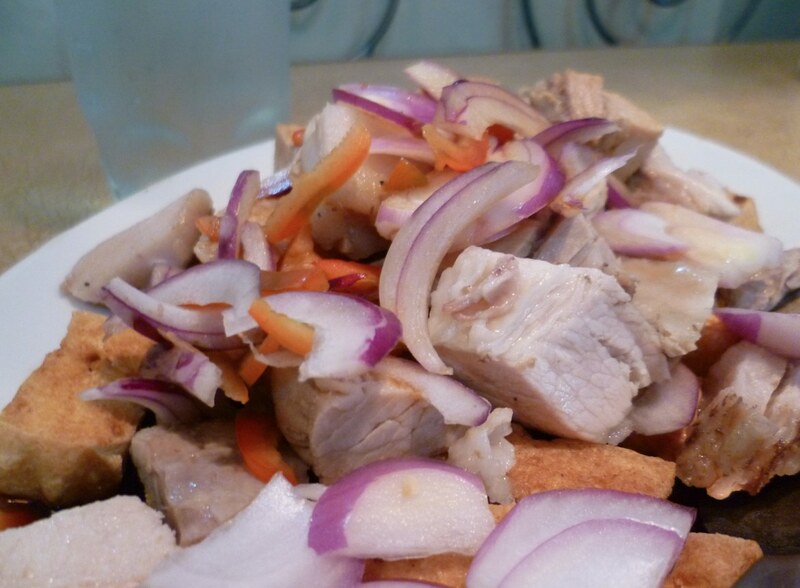 Filipinos take the pork salad to the next level. In the simply named tokwa't baboy (literally tofu and pork), luscious pork is paired with deep fried tofu, dressed with a vinegar, chile and soy dressing. Often served as drinking food (pulutan), it demonstrates the hybrid nature of the cuisine, drawing from Chinese and Malay influences, but distinctly it's own. Tofu here is no diet meat substitute.